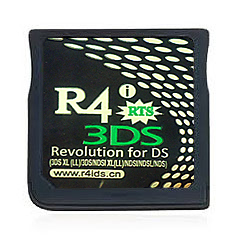 DS devices :: R4i 3DS - R4i Gold 3DS RTS - ModChipsDirect :: North Americas #1 Mod Chip Reseller! Everyone is buying these mainly for NTRboot, so we now have the R4i Plus made by the same team <-- Buy here. We will not be restocking this SKU as the other is the replacement! Ships from within the US, Michigan, not China like all other sellers! This is a premium R4 that is able to run wood firmware. "Recieved it in 3 days in California. Works perfectly. No complaints." "First time buyer of these types of chips on this site since I didn't know the best place to get them. No regrets!" "It does what it needs to. The interface is rough, but functional. I've bought this card 3 times due to compatibility with different firmwares." "Great product. Just bought a 3DS off of Amazon and it worked perfectly with this card." "This site is legit, super fast shipping, the productsworks fantastic and great prices. "Received an R4I from this website, and it was bricked on arrival. No game icon on 3 different NDS (NDS/3DS/N3DSXL) system tests. Did not work straight out of packaging, and I didn't even get a chance to update to brick it myself for it to be an error on my part. Shipping was good, however. admin note: product was replaced under warranty"
"Works perfectly, after getting the correct kernel. Arrived pretty quickly, and in excellent condition." "If you are doubting the shipping speed or you think this is a scam, you can see my shipment tracking here: https://tools.usps.com/go/TrackConfirmAction?qtc_tLabels1=9400111899562556655588 This site is reliable and safe. Great service. Got this 3 days after I ordered from New York to Texas!!" "excellent service, 4 day shipping from new york, good product quality. highly recommended, this is not shipped from asia and it is not a scam or rip off like most sites. PLEASE AT ALL COSTS AVOID SHADY SITES LIKE R4-USA.COM. THIS IS LEGIT." "I ordered this on Sunday, March 29, 2015. 2 days later, I received confirmation that it had shipped and I got a tracking number! I tracked it all the way and it ships out of NY, goes to Rochester, NY, and then goes to your location from there. Completely legit, I got my card in the mail 4-5 days after I ordered it! No rip off, highly recommend, card works perfectly with 8GB Micro SD. If you want to avoid sketchy websites, you are a new r4 card buyer, or you don't want to get ripped off, please buy from this site. I know the selection of cards is extremely limited, but you are guaranteed excellent service and instant shipping from within the USA!! THANK YOU SO MUCH MODCHIPSDIRECT! :D"